It’s hard to believe. 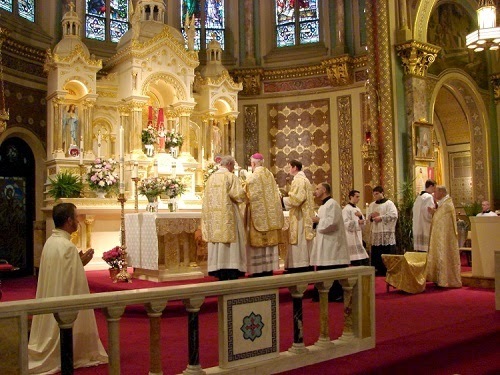 This past weekend marked the 29th anniversary of the first Traditional Mass celebrated in New Haven, CT under the auspices of the St. Gregory Society of New Haven. It was on Jan. 12, 1986, that weeks of planning culminated in the first Missa Cantata on the Feast of the Holy Family. The late Rev. Robert Ladish, then-pastor of Sacred Heart Church, walked out into the sanctuary of that venerable building and began a liturgical odyssey that continues to this day. Under the indult, Quattuor abhinc annos, Pope St. John-Paul II gave the traditional mass back to the Church, and prompted the formation of the St. Gregory Society. In order to qualify for the limited celebration of the traditional rites, a petition had to be forwarded to the local bishop, showing that a group of people was interested in attending. The group had to be loyal to the Church’s Magisterium, and accept that the post-conciliar liturgical books were valid. Under these (what seem to be today) restrictive provisions, a petition could be submitted to the local chancery; but, there was no guarantee the bishop would agree. Still, with the petitions readied, Nicholas Renouf and Britt Wheeler formed the society in hopes of garnering enough signatures to present to Archbishop John F. Whealon, STD. That is where this writer came into the fold. While shopping at my local supermarket, I saw a flyer on the bulletin board concerning the return of the TLM to New Haven, and whom to contact in order to get the details. Renouf was the music director at St. Mary’s Church, best known for being the parish church of Fr. Michael McGivney and the place where the Knights of Columbus was formed. Wheeler, a well-known harpsichordist and organist, was music director at St. Joseph’s, New Haven. It was Wheeler, with whom I made contact, realizing that we had met each other about a year before. It is a point of amusement now, but our conversation centered on whether or not the Masses contemplated would be (as I put it) the “real thing.” Living through the post-1962 alterations to the Missal, the 1965 “missa mixta”, and then the total destruction of the Missal leading to 1970, I wanted assurances that this would be unadulterated. Britt checked all the boxes. He knew I was involved in my parish church, the Scalabrini Fathers’ parish of St. Anthony in New Haven, and that I was involved in the ceremonies there. He asked me to be Master of Ceremonies, and the rest, as they say, is history. The St. Gregory Society was one of the first organizations of its time, though it did not sponsor the first mass in Connecticut. That honor goes to the Rev. Jeffrey L’Arche, MS, and the LaSallette church of Our Lady of Sorrows in Hartford, which began in the fall of 1985. From the outset, the goal of the SGS was to present the traditional rites in the best way possible. Fr. Ladish was completely on board with the idea. It was his idea to have the Latin Mass in his parish church, and it was his goal to be a pastor to the people who attended. He was well aware how marginalized they had been for two decades. At first Archbishop Whealon was going to allow monthly Masses in New Haven on the second Sunday of every month, corresponding with other Masses in Hartford (first Sunday) and Waterbury (third Sunday). That arrangement lasted for three years, when we were given permission to have weekly and holy day Masses. The anniversary dates of SGS became big events. In 1987, the first anniversary was celebrated with Auxiliary Bishop John Hackett presiding. His words following the Mass still resonate with longtime members. He was thrilled and happy the Mass was being celebrated. Two years later, the Archbishop himself presided, with nearly 2,000 people attending, the largest congregation Sacred Heart had seen since the 1950's. The Society, meanwhile, had established itself as a go-to group for others looking to start Masses in their own dioceses. Tutorials and training sessions were conducted under the auspices of the SGS in St. Agnes Church, New York City, Holy Trinity, Boston, for priests of the neighboring Diocese of Bridgeport, the Diocese of Springfield, Massachusetts, and others. When Alfons Maria Cardinal Stickler celebrated in St. Agnes’ in 1992, the Society aided with the training of the servers and clergy and offered any other assistance necessary. My car became a rolling sacristy as cassocks, torches, vestments and other things were piled in for that Mass. In October of that year, the FSSP established itself in the Diocese of Scranton, Pennsylvania, at the invitation of Bishop James Timlin. It was the Schola Cantorum of St. Gregory Society that provided the music, and the servers and MC of SGS that aided in the inaugural Mass in the presence of Bishop Timlin. The schola had established itself early on as one of the finest groups doing chant and polyphony. A series of recordings was begun, putting the music of Renaissance masters in context, complete with propers and lessons of various feasts. The late Michael Davies was invited to New Haven to speak at our fifth anniversary celebration, and became a friend of the Society and one of its biggest proponents. Through his good offices, the Christmas recording featuring Palestrina’s Missa O Magnum Mysterium was broadcast by the BBC as the music for its daily Christmas meditations. He remained a friend of SGS to his death. Archbishop Whealon, who at first was guarded in his response to the group, heard the recordings, read pamphlets and newsletters the Society published, and warmed up to what was being done. Before he died, he sent a letter blessing the work, and presented to the SGS his personal copy of the Pontifical Canon, which has been used at several pontifical functions. Many alumni of the Schola moved onto other positions, and have continued the work of bringing the Church’s musical and liturgical patrimony to various dioceses. Most if not all credit Renouf and Wheeler for allowing them to sing chant and polyphony in its proper context. Attention to ceremonial has been paramount concern from the first, and the tutorials for servers and priests are an important mission of SGS. Dozens of priests have had personal tutorials to learn the Mass, and hundreds of servers have been taught over the years. Many things have changed over 29 years. Sacred Heart Church closed, and the Society moved its liturgical celebrations to St. Stanislaus, a Polish Vincentian parish. The political winds have made those who desire tradition more welcome and less suspicious. Note: Pictures are of Sacred Heart Church (top) and Bishop James Timlin celebrating the 25th anniversary mass of SGS at St. Stanislaus Church.